Hi Everyone... Since GC is away, and it's already Feb. 21, I thought I would write this month's POTM. A legendary Pokémon in China. Many people are charmed by its grace and beauty while running. Its magnificent bark conveys a sense of majesty. Anyone hearing it can't help but grovel before it. Flash Fire - Raises the power of fire-types attacks by 50% when struck by a fire move; fire immunity. Intimidate - Lowers the opponents Attack by one stage on switch. Justified (hidden) - Raises attack 1 stage when struck by a dark move; does not give dark immunity. Love Arcanine! He's the physically defensive cornerstone of the Pokemon Wars Fire Gym. Although he's been rated as UU in BW and will likely stay there in XY, Arcanine is definitely usable in OU and is often a great asset because many players don't know what to expect from him. Arcanine has a 555 BST is great; what prevents him from shining in any one role is that it's very well rounded. His 90/80/80 defences are usable, and his 110/100/95 offences are great, but not outstanding. Offensively, Arcanine is one of the few Pokemon that can have great success going mixed. Access to the rare Extreme Speed makes him a good late-game cleaner, and STAB Flare Blitz is nothing to laugh at off 110 base attack. Arcanine also gets great coverage options in Close Combat, Crunch and Wild Charge (and, oddly enough, Outrage from BW2 tutors). Arcanine can also pack a special move to surprise common physical walls like Skarmory and Slowbro, including Fire Blast and Solar Beam (on sun teams only). 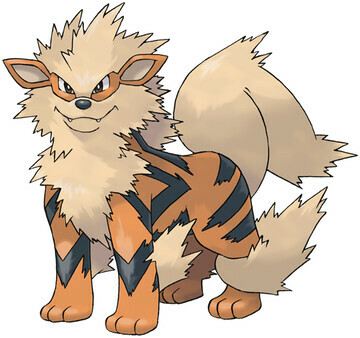 Intimidate allows Arcanine to run a Lonely or Hasty nature without being overly frail on the physical side. The lack of secondary STAB is one of the things keeping Arcanine out of OU, but he's still no offensive slouch. On the defensive side, access to intimidate, will-o-wisp and morning sun make him a usable physical wall. While he is outclassed in pure defense by other recovery walls like Slowbro, Skarmory and arguably Quagsire, Arcanine distinguishes himself by being able to hit back hard. He also gets a decent support movepool including Roar, Morning Sun and Swagger. This is a straight up physical attacking set with great coverage. With this set, Arcanine is an average wall-breaker and a great cleaner. Although Arcanine isn't able to effective raise its stats, it's raw power and high BP coverage moves mean it's quite difficult to stop. Although Arcanine is walled by fire-resistant physically-defensive walls like Hippowdon and Slowbro, he's still extremely dangerous when these checks are removed. Here, Arcanine's base 95 speed holds it back due to the large number of base 100 speed Pokemon in OU, but Extreme Speed circumvents this somewhat allowing Arcanine to beat Pokemon like Talonflame. Throwing Overheat into Arcanine's set makes him a potent wallbreaker. Dedicated physical walls like Skarmory and Hippowdon that switch in to take Arcanine's physical attacks are roasted by Overheat. Although Overheat lowers special attack 2 stages, this doesn't necessarily force Arcanine out either since he can continue to use his physical attacks unhindered. This set is somewhat more fragile on the physical side due to the nature choice, but intimidate helps with this. The combination of reliable recovery, intimidate and will-o-wisp make this set highly viable despite its counter-intuitive nature. With max bulk investment, Arcanine can switch in on powerhouses like Dragonite and even Tyranitar, take the hit, will-o-wisp, and then recover damage. Extreme speed is a very rare move that you should never pass off due to its high base power and +2 priority, meaning you may actually be able to clean up weakened teams with your physical wall! Flamethrower lets you break ferrothorn, forretress and other defensive steel-types, while roar lets you deal with set-up sweepers using substitutes. Oh well. Arcanine is pretty cool too. Feraligatr will be for March... unless Garchomp makes a comeback. Good post Far, thanks for doing this. We appreciate the assist. We will keep the current poll up till the end of Feb then have the winner for March.